Fresh tomatoes are not high on my list of favorite foods; in fact, they don’t even make the list. It is mostly a texture issue, because once processed in any way, tomatoes rocket pretty close to the top of my savory food favorite list. I remember well the first time I tasted sun dried tomatoes. I was having dinner in San Antonio with my brother and sister-in-law at a local restaurant they frequented. My fusilli pasta dish featured extra virgin olive oil, black olives, artichoke hearts and sun dried tomatoes. It was simple, light and so delicious. For me, the sweet sun dried tomatoes were the star. As you may know, the drying process enhances the natural sugars in vegetables, and tomatoes develop a delightfully chewy texture. 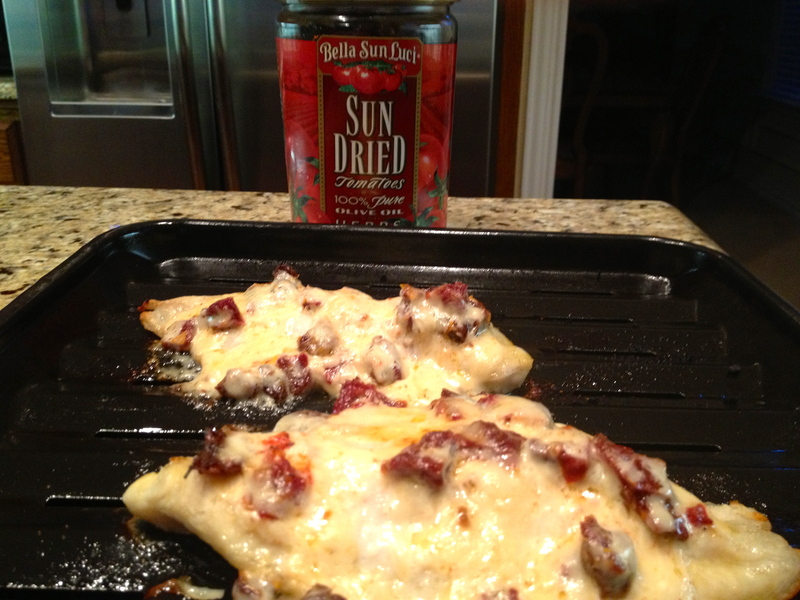 I’ve used dry-packed and oil-packed sun dried tomatoes and I much prefer the latter. For one, I don’t have to allow time for reconstitution of the dry-packed tomatoes because, really, I seem to never have extra time. I also love including some of the tomato infused olive oil in recipes for additional flavor. I’ve become somewhat addicted to Bella Sun Luci Sun Dried Tomatoes, but happily, this is a healthy addiction. Sun dried tomatoes have approximately twelve times the lycopene of raw tomatoes. Lycopene fights free radicals, potentially protecting against heart disease, digestive disorders, and certain cancers. The Bella Sun Luci brand is owned by Mooney Farms, a family owned farming operation that began primarily as a kiwi farm. They added sun dried tomatoes to their product line sold at local California farmers’ markets, and they quickly became the family’s signature product. Today, three generations of the Mooney family maintain their commitment to quality products celebrating Mediterranean-style cuisine. Catfish might not be your go-to ingredient for a Mediterranean dish, but a creamy topping of mayo, butter, parmesan cheese and sun dried tomatoes sends this traditionally deep-fried southern favorite on a Tuscan vacation. With a prep time of less than 20 minutes from oven to table, it has become part of our regular weeknight menu rotation, and it is so tasty. Quick, easy and delicious – hallmarks of a successful recipe at our house! Preheat broiler to 500 degrees. Coat a broiling pan with nonstick cooking spray. Brush both sides of fillets with lemon juice, and then sprinkle with salt and pepper. Place fillets flat side up on prepared pan. In a small bowl, mix Parmesan cheese, butter, mayonnaise, and sun dried tomatoes. Broil fish about 4 inches from heat for 6 minutes. Remove pan from oven, and turn fillets over. Spread the cheese mixture evenly over each fillet. Broil an additional 4 to 6 minutes, or until fish flakes easily with a fork. I’ve seen Bella Sun Luci Sun Dried Tomatoes in markets around town, including Costco, where I buy a very large jar. If you can’t find them in your area, Mooney Farm’s website offers online ordering, including some neat gift baskets. Add a delicious and healthy Mediterranean twist to your menu!